Setting out on my last day walking the Camino from Mansilla de las Mulas. I walked the Camino Frances in three trips. 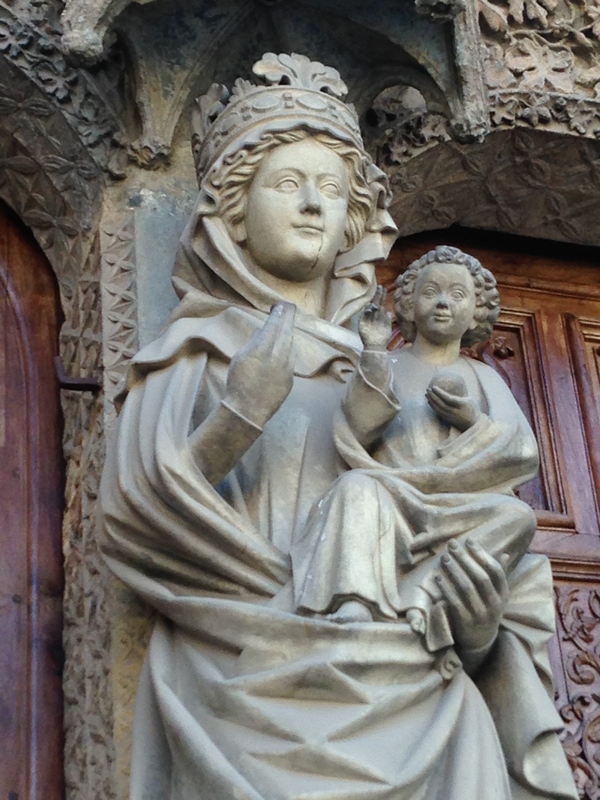 Camino 1.0 was from St. Jean-Pied-de-Port to Burgos, in June, 2013. 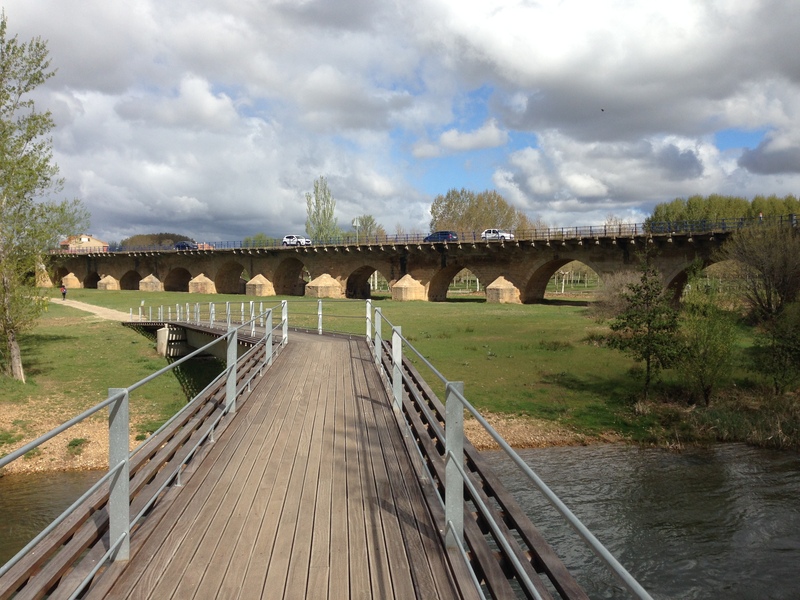 Camino 2.0 was from Leon to Santiago, in October 2013. That left the section in the middle from Burgos to Leon for my Camino 3.0, in April, 2015. That’s the short story of why I was walking into Leon on April 19th, 2015. 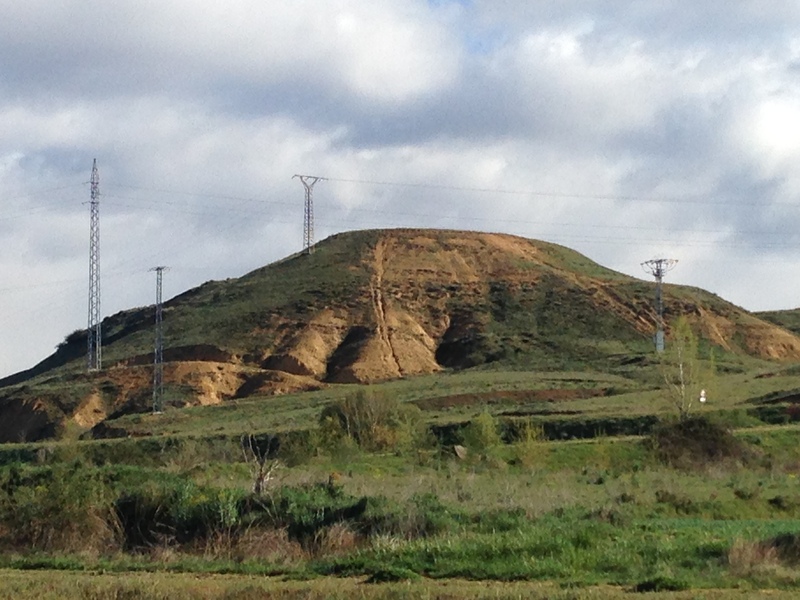 After 10 days of walking from Burgos, I was in Mansillas de las Mulas, only 18 kilometers away from Leon. Here’s the long story of what that day was like. The night before I walked into Leon I was seriously thinking of taking a taxi because one of my ankles was hurting and when I talked with my husband on the phone, it seemed like the logical thing to do. The walk into Leon was known to be tedious, and lots of pilgrims bussed through it. 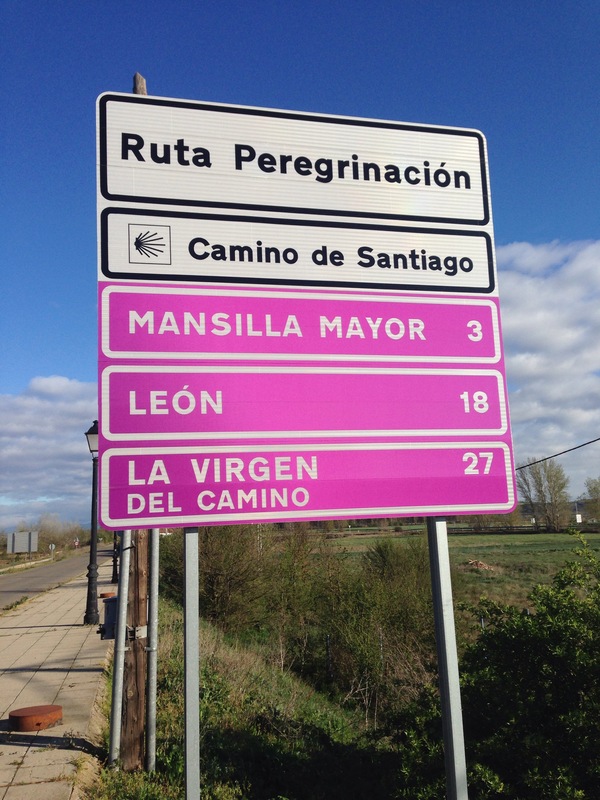 When I began my second Camino, in October 2013, from Leon, I took a taxi out past the suburbs, and I didn’t regret it. But when I got up the next morning to head out from Mansilla de los Mulas towards Leon, I felt I needed to walk at least part of the way. I decided I’d see how I felt as the day unfolded. I had mixed feelings about finishing my Camino 3.0, and finishing the whole Camino in general. The April trip was empowering. I totally enjoyed the walking, the solitude, and the conversations along the way. Every day I felt physically challenged and spiritually fulfilled. The Camino was as magical as it had been before. Each of my three trips had its own flavor, its own season (summer, fall, and now spring) and each trip took me deeper into the spirituality of walking solo. Camino 3.0, across the Meseta, had been more contemplative than the other two trips, more like a retreat. 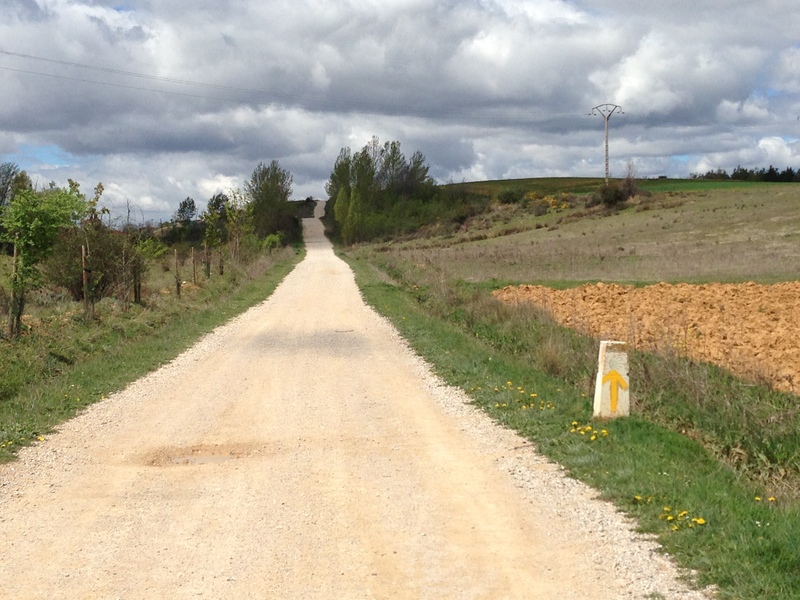 There was something very attractive about the sureness of following the yellow arrows on the Camino. But now the adventure was about to end, and I found myself feeling of sad and wrestling with the feelings of “what’s next?” I didn’t want Camino 3.0 to end. When I was a kid I had the habit of saying, “Oh, it doesn’t matter.” My Mom used to respond with, “No, everything matters,” which would make me angry. I realize now that I used to say “It doesn’t matter,” when I couldn’t express my feelings very well, and that my Mom said “No, everything matters,” to help me. But she didn’t quite know how to get me to open up and share what was going on inside. As an adult, and a Mom myself, I realized how frustrating it must have been for her to try and help me process my feelings. I still struggle with that feeling of emotional ambiguity as an adult, and I was in one of those frustrating “Oh it doesn’t matter” kind of moods as I left Mansilla de las Mulas, and I spent a lot of the day debating whether I should call a taxi or not. Even on the last day of walking, the Camino had something to teach me. In the morning, I prayed for strong ankles, and to be open to what the Spirit wanted me to learn. I ate a late breakfast at my beautiful little hotel in Mansilla de las Mulas with the group of Irish women walking together I’d met the night before. 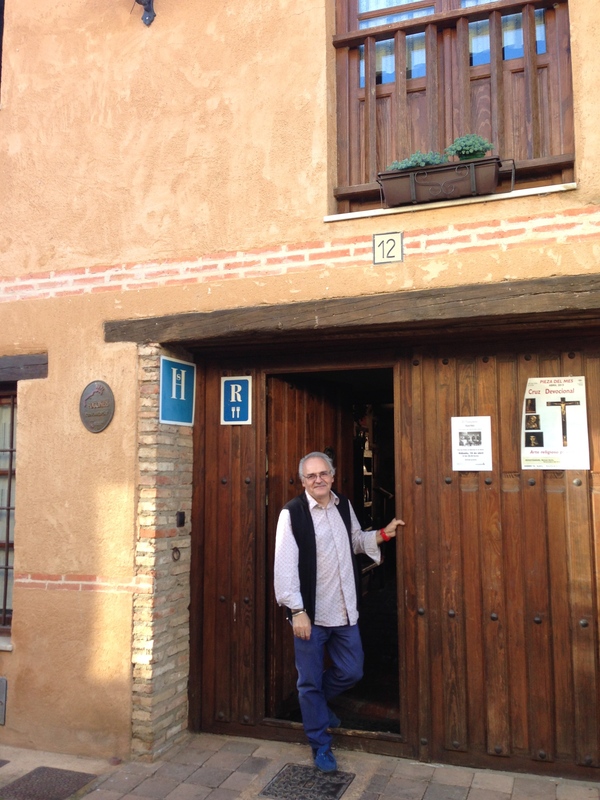 Javier, the owner of the hotel, said “Buen Camino,” and waved me onto the Camino. He was one of the many gems of hospitality I’d met along the Way. 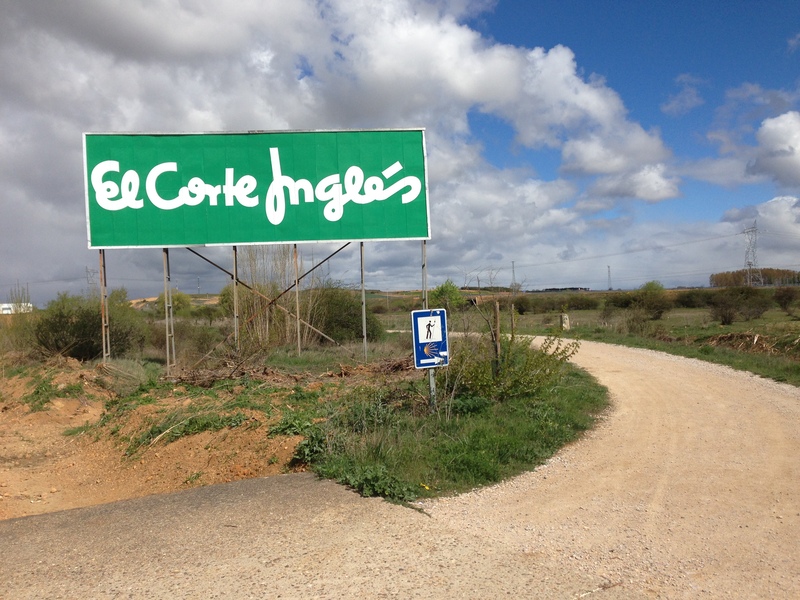 The 18 kilometers to Leon were not scenic, or beautifully empty, like the Meseta. But there were memorable moments. Hill fort where the ancient Asturians lost their last battle with the Romans. There was the hill fort at kilometer 3 where the ancient Asturians lost their struggle with the Romans. Right in front of it was a gas station. I love the juxtapositions of eras along the Camino! There was a long, medieval bridge at kilometer 6 that was still used by cars. A modern pedestrian bridge had been built alongside it for the pilgrim traffic. I ducked into a village church in Villamorros in the middle of a Mass, and was happy to see a young girl assisting the priest at the altar. At about kilometer 9, my left ankle began to hurt again. It was midday, and it was hot for April. The Camino was shunted under highway overpasses, and ran next to junkyards. That was the low point. For the first time since I’d left home, I wondered about how safe it was to be walking alone. Why was I doing this again? The guidebook said there was an albergue and café just up ahead in Arcahueja. Maybe that’s where I would call my taxi. 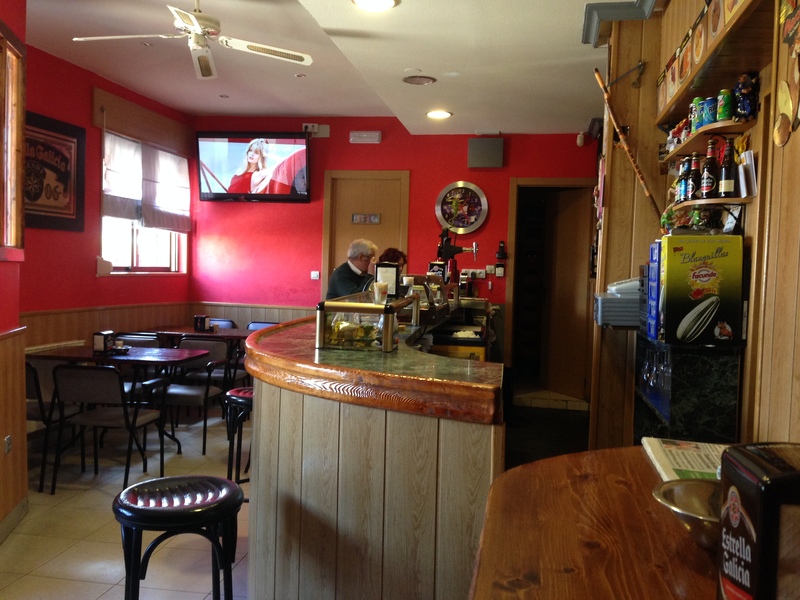 When I got to the cafe, I found the five nice Irish women I’d met in Mansilla hanging out. They looked pretty out of sorts, too. We said, “hello” and complained a little about the heat. I asked the bartender how far it was to Leon. He said it was only 11K, and “there’s a beautiful view of the city just up ahead.” (I’m sure he tells everyone that!) I asked if a bus stopped in the village or if they had a taxi. “No” he said. Hmmm. I ordered a slice of tortilla, two deviled eggs, and a café con leche. What should I do? I felt bone tired and was so tempted to call a taxi. My food arrived, and I realized I was ravenous. Once I finally got clarity, I felt the need for some encouragement to make it into Leon. I had an idea. I turned on my phone and checked into the American Pilgrims on the Camino Facebook page. It was 4 a.m. in California, and 7:00 a.m. on the East Coast. Someone must be up and reading the page. I posted that I was 11 K out of Leon and was tempted to take a taxi, and needed some support. I posted it on this blog, too. Immediately, waves of energy started rolling into that little café in Arcahueja through my iPhone! “You can do it! Don’t quit! Feel the burn!” Over a hundred people responded, cheered me on, and sent prayers via the APOC Facebook page. My brother-in-law in Washington, D.C. saw the post on the blog and gave me a big PUSH. The Camino taught me—again—that sharing my feelings and asking for support is ok. Feeling vulnerable is ok. It’s usually in those moments when God reaches through our stoic armor and touches us. My unspoken prayers during my morning’s walk were answered. I said “Buen Camino” to the Irish crew and headed back out on the Camino, now excited to continue. The guy behind the bar had exaggerated just a little though; it was a long time before I saw the view of Leon. I passed big box stores, and auto dealerships, and medieval churches with storks nesting on top of them. The funny thing was, my ankle stopped hurting completely. It was amazing. I picked up the pace. There seemed to be very few other pilgrims walking that afternoon. The Camino crossed the Autovia (freeway) on a dedicated pedestrian bridge, and the amount of concrete and apartment buildings reminded me of my long walk into Santiago in the rain, in October of 2013. But weather was good, and I was very thankful. 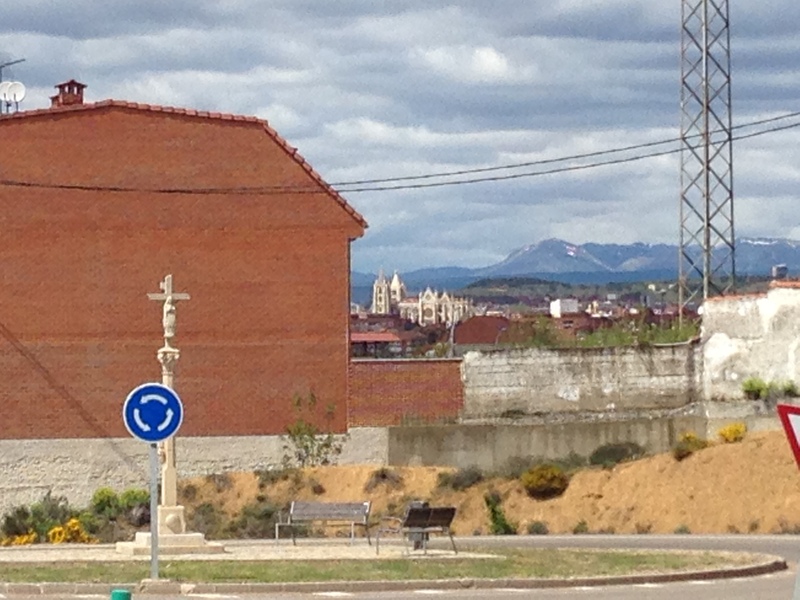 Out in the distance I could see the Cathedral in Leon, with the snowy mountains behind it. How I wished I could keep walking on to Astorga and beyond. 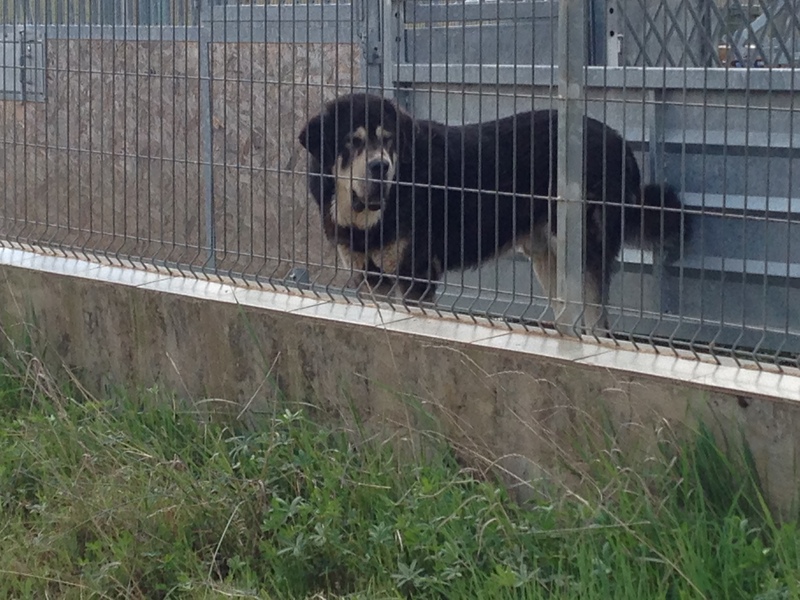 It was a new experience to know what was up ahead on the Camino. That’s when I knew that I had almost finished the whole Camino Frances. The Cathedral in view at last, but still a long ways off. Walking from the bar in Arcahueja to the Cathedral took about two hours of brisk walking. I felt great, aligned in my purpose. The feelings of sadness about finishing were still there, but I didn’t blow them off by calling a taxi. I walked and felt sadness and joy, and was determined to finish strong. Once past the newer parts of Leon, passing apartment blocks and crossing roundabouts, The Camino bridged a small stream and led me through the ancient city walls. It continued into a tangle of medieval streets and spit me out on the grand avenue in front of the building designed by Gaudi. Suddenly, I knew where I was. The Cathedral was just up ahead. And then I was standing in front of it, looking up at its fantastic exterior. It was nearly 4:00 p.m. on a Sunday afternoon, and the doors were closed for Siesta. When the adrenalin subsided, the sad feelings welled up again. No one was there to celebrate my arrival, and I had a wave of homesickness. But Mary was there, up on her pedestal outside, by the locked doors, holding baby Jesus in her arms, and she was smiling. Mary greeted me, and sent me off to my hotel to check in and relax. I was grateful for the lessons I’d learned that day. I wasn’t really alone. The Spirit was with me, and I felt blessed by the wave of energy and love from my fellow Pilgrims back in the States that had swept me on, to finish Camino 3.0, and the entire Camino. Amen. What a coincidence that we completed the Camino in the same number of trips in the same sequence. It’s amazing how an ancient route so far away can still bring people from all over the world together thousands of years later. Our journey continues. Buen Camino! Bravo! 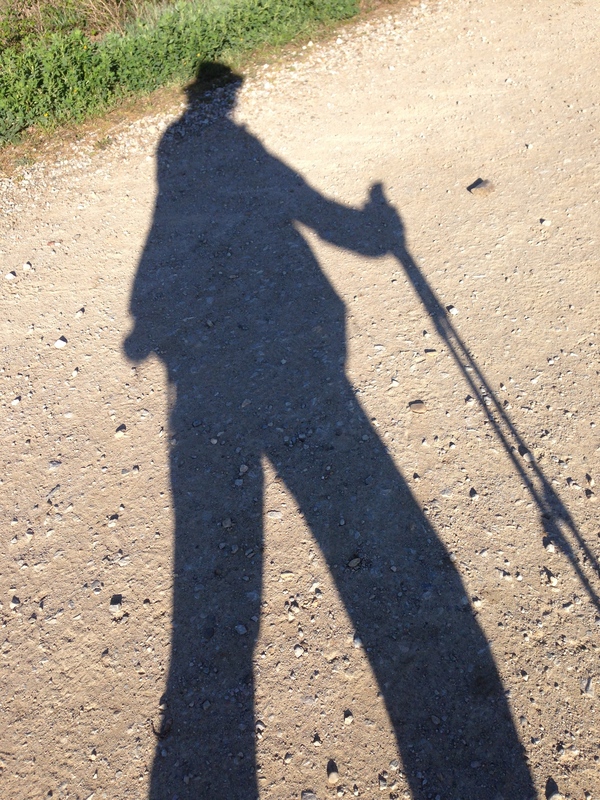 I have so much respect (and awe) for those who’ve completed their Camino Frances or some other Camino routes. I’ve only done the minimum 100. I feel touched by your faith and tenacity! Dear one, thanks so much for your beautifully descriptive summation of what you went through that last day of Camino 3.0! I honor your spirit, faith, the quest and most of all your amazing tenacity! Love you dearly. Stay strong always Boomer! 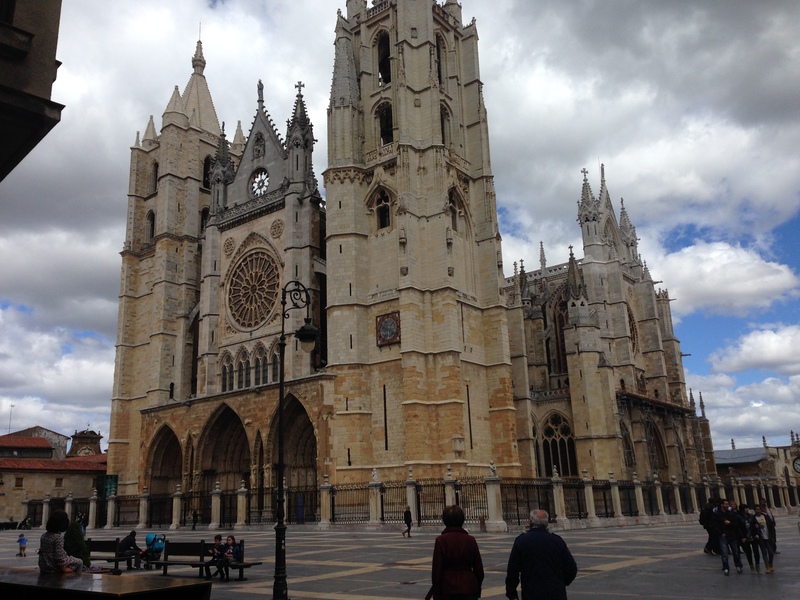 Beth, what a great way to complete your Camino! I love how you turned to the APOC group for encouragement. The Camino provides a network of supporters on Facebook too! Any plans for Camino 4.0? Thanks, Laurie! Thanks for reading the blog. Ahh, Camino 4.0! I would love to start over in St. Jean in the next couple of years!